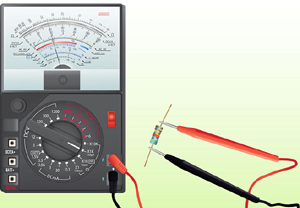 The meter which measures the resistance and the continuity of the electrical circuit and their components such type of meter is known as the ohmmeter. 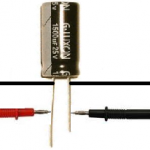 It measures the resistance in ohms. The range of a megger may extend to more than 1,000 megohms. 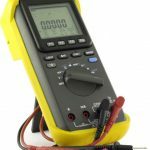 Micro Ohmmeter, Mega Ohmmeter and Milli- Ohmmeters are used to measure resistance in different applications of electrical testing. It consist of 2 coils, coil ‘C’ and coil ‘P’ fixed right angles with one another. 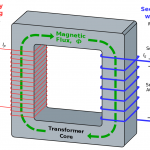 When current flows through these two coils, both the coils, exert force on the magnetic needle. The direction of these two forces are exactly opposite, to each other. 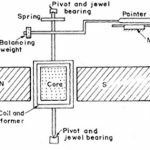 Coil ‘P ‘ exert the force on the magnetic needle and tries to move the needle such that it align along the axis of coil ‘P’. 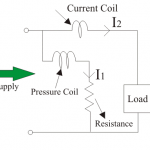 While the force exerted by the coil ‘C’ on the magnetic needle makes it alying along the axis of coil ‘C’. Pointer is attached to the magnetic needle, the scale of this meter starts with ‘∞’and ends at ‘0’.It is scale calibrated in kΩ .